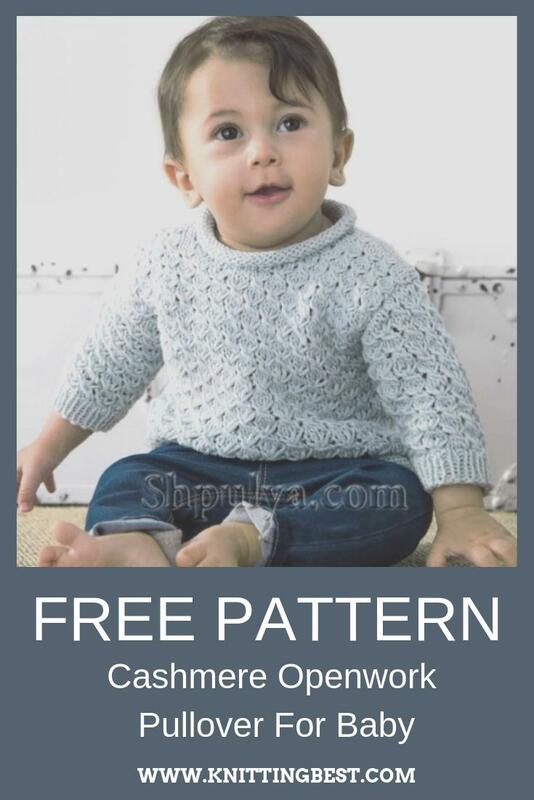 You will need: 100% Cashmere Lana Grossa yarn (100% cashmere, 87 m / 25 g) - 100 (100) g light blue (color 12); Straight needles number 3.5, a set of stocking spokes number 3.5, hook number 3; 2 buttons with a diameter of 12 mm. Differing data for larger size is given in brackets. If only one number is specified, it applies to all sizes. Gum: alternately 1 p. Of the front surface, 1 p. Of purl. False pattern of "braids", the number of loops is a multiple of 6: see the diagram. Only persons are given on it. R. or odd krug.r., in ex. R. or even circle. knit loops on the pattern. The rapport of 6 points between the arrows constantly repeat. Repeat 1-4th r. / Krug.r. Knitting density: false braid pattern (needles no. 3.5) - 21 p. X 27 p. / Circle. = 10 x 10cm. Front and back: front and back to armhole knit in one piece in circular rows: dial 108 (120) on the spokes number 3.5 and knit 8 circle. individuals. n. Then execute arcs along the edge: * cross thread of the 6th out. n. with izn. side shoot forward, circling around the dial edge, on the left knitting needle, knit it along with the trail. P. facial, repeat from * 18 (20) times. Then perform a false pattern of "braids". Mark side seams = start krug.r. and after half = 54 (60) n. each half. After 13.5 (15.5) cm from the start of work for the incision, divide the work in the center of the back and knit in straight and back rows. Through 15.5 (16.5) cm from the start of work, for armholes to divide the product along the side seams and first knit before. For armholes, close 1 x 5 p. = 44 (50) p. After 19.5 (21.5) cm from the start of work, close the central 8 (10) p. For the neckline cut and both sides to knit separately. For rounding the cutout on the inside, close in each 2nd p. 1 x 2 p., 1 x 1 p. And next. 4th p. 1 x 1 p. After 25 (27) cm from the start of work, close the remaining 14 (16) p. Finish the other side symmetrically. Then, perform the right half of the back and close the armhole 1 x 5 at the side seam. 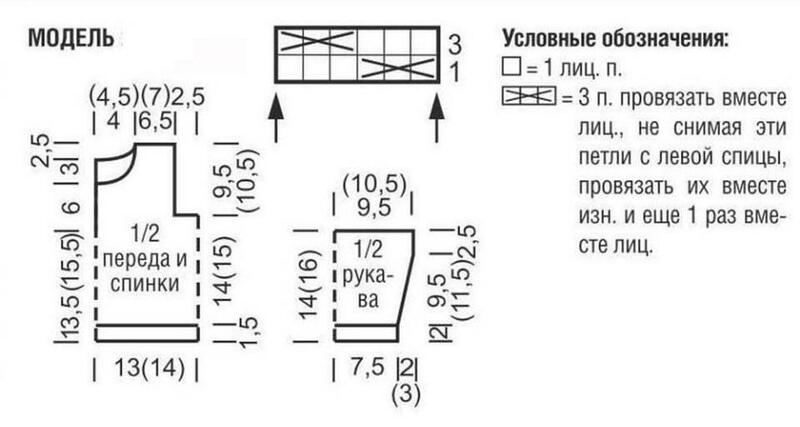 After 22.5 (24.5) cm from the start of work, close it from the inside to cut the neck 1 x 5 (6) section and in each 2- m p. 1 x 2 n. And 1 x 1 n. In 25 (27) cm from the start of work, close the remaining 14 (16) n. Finish the left half symmetrically with the right. 5) cm from the start of work close on the inside for the neckline cutout 1 x 5 (6) n. And in every 2nd p. 1 x 2 n. And 1 x 1 n. In 25 (27) cm from the start of work, close the remaining 14 (16) n. Finish the left half symmetrically with the right. 5) cm from the start of work close on the inside for the neckline cutout 1 x 5 (6) n. And in every 2nd p. 1 x 2 n. And 1 x 1 n. In 25 (27) cm from the start of work, close the remaining 14 (16) n. Finish the left half symmetrically with the right. Sleeve: dial 32 points on the needles No. 3.5 and knit with 2 cm elastic and between the edge ones perform a false pattern of "braids". For bevel sleeves, dial on both sides 1 (0) х in each 6th p. and 4 (7) x in each 4th p. 1 p. = 42 (46) p. The dialed loops should be included in the false pattern of “braids”. After 14 (16) cm from the start of work, close all loops. Do the second sleeve in the same way. Assembly: Stretch parts, moisten and allow to dry. Run shoulder seams. Seal tie 2 p. Art. b / n, and in the 2nd p. on the left half of the back, make at the equal distance from each other 2 holes for buttons (= under 3 points skip 2 items b / n). Along the edge of the neckline dial 56 (60) section on the stocking needles No. 3.5 and knit 1 p. rubber band. Then perform 2.5 cm faces. smooth and all loops close. Run the seams of the sleeves and sew the sleeves. Sew buttons.